Children have an internal drive to be creative. Observe their pretend play when they are outside, artwork they create without much effort, or conversations they have with themselves when they think no one is listening and their creative spirit is evident. However, teachers and parents have roadblocks that can prevent them from providing additional situations for children to express themselves and be creative. As a teacher, I found there were many roadblocks that stifled my creativity in the classroom such as rigorous curriculum expectations and pre-defined restrictive learning programs. As a parent, I find many roadblocks too. Life can be extremely busy with numerous obligations and daily duties. Additionally, raising children can be exhausting because of sibling rivalry, constant requests for assistance, and discipline - sometimes even the thought of playing with my kids is hard. Teachers can sense when their students are stressed with assignments or uninterested with the subject matter. Parents know when their child is bored or frustrated. They can feel when tempers are ready to flair or a meltdown is on the horizon. It is in the nature of parents and teachers to respond before things get worse. Ultimately, parents and teachers want there children to be happy, involved, and engaged. Teachers and parents both want their children to have fun while learning skills that will lead to success in the future. Last fall, I was able to attend the ceremony that opened the school year for a local school district. The superintendent discussed rapidly changing technology and its impact on the lives of students. He conceded that it is unknown exactly what jobs students will be applying for in the future. However, he reminded teachers that it is still your job to prepare them for their careers, and suggested that employers will always need creative thinkers. In closing, the superintendent asked teachers, despite everything he already requests, to set aside time to allow their students to be creative in the classroom. I was excited to hear his plea because for years all I have been hearing about was state learning standards and standardized testing - roadblocks. This week, teachers from this local school district are fulfilling the request of their superintendent. They are finding time to provide their students with a opportunity to be creative. They asked me for assistance with an author study and I suggested celebrating William Joyce's birthday, a person who was named by Newsweek as one of top 100 people to watch in the new millenium. He is the author and illustrator of largely autobiographical books like Rolie Polie Olie that is "a caricature of my own family even down to the family dog." 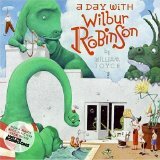 (HarperCollins) and A Day with Wilbur Robinson which is based on many of his extended family members. He has other uniquely creative books including George Shrinks and The Leaf Men (which is currently in movie production). Getting kids really excited about William Joyce is easy because he was a conceptual artist for the movies Bug's Life and Toy Story. Additionally, he was the executive producer of Meet the Robinsons and producer of Robots. 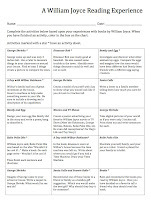 To spark creativity and higher level thinking in their classrooms, I developed a good sized set of activities to accompany the books by William Joyce. We looked at all of his books and found things we liked about each. For example, we loved the idea of George shrinking to be only three inches tall in George Shrinks, all the crazy gizmos and gadgets in A Day with Wilbur Robinson, and the egg Bently decorates in Bently and Egg. We then thought about how we could bring those ideas to life. We came up with activities like making a 3 inch model of ourselves out of clay, taking digital photos from George's perspective, drawing your own invention, and decorating your own hardboiled egg. Next week, the second grade students will be engaged in "The William Joyce Reading Experience." As a result of his teachers and parents William Joyce created movies and books that broke through the roadblocks to allow my children and students at a local school to be creative this week. It was exciting to hear my own children talk about inventions they could make, talk about "It would be cool if..."(how Joyce sums up Rolie Polie Olie) before bedtime, and pretend to be robots. William Joyce's creativity has spread exponentially and we hope we can keep it going by inspiring you to read a few of his books this week. We had a blast! Oh yeah, please make sure you watch Meet the Robinsons. It is my new favorite animated movie! I'll have to check out Santa Calls. What a cute title! Thanks for participating in Book Talk Tuesday! You put so much work into this blog! Wow! What a great resource you are providing!